5240 Table Top Test Enclosure, QC/QA, EMI/RFI testing, 12" x 12"
The 5240 Table Top Test Cell is a Portable Concept in High Performance EMI/RFI Test and Repair. The ETS-Lindgren 5240 Series Table Top Test Cell is a high performance, portable shielded enclosures designed for fast, convenient EMI/RFI testing and verification. 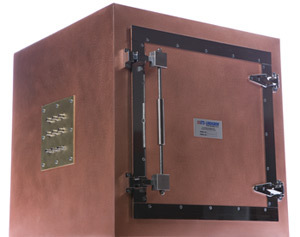 Built to the same reliable shielding standards as full size ETS-Lindgren enclosures, the Table Model Enclosure provides effective shielding in a compact, easy-to-use format. Designed to meet a variety of demanding testing, QC/QA, and repair requirements calling for shielding performance through 120 dB, the 5240 Series is ideal for wireless, cellular, PCS, radio, cordless, and pager applications.